Acceptance is vital to personal and professional success. Accepting what is present provides you with a solid platform to make better decisions, including the decision not to do anything. There are many levels of acceptance based on your ability and willingness to be in a situation without attempting to change, deny, dispute or ignore it. You do not have to understand a situation to accept it. Even if you mentally understand something, or think you do, it is a waste of time and energy if you don’t accept the situation. First focus on acceptance and be aware that you do not need to know why something is present, or know all the details. Move into acceptance as quickly as you can. Do not be distracted with over thinking. It’s good for your health and your relationships, including the relationship you have with yourself. 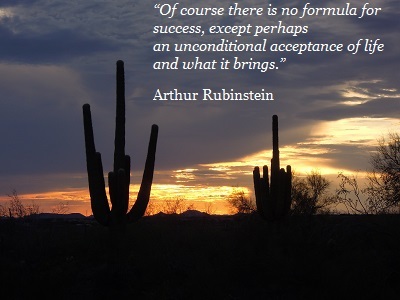 Accept wherever you are on the acceptance continuum. Acceptance is not consent or agreement. It does not mean staying in toxic and negative environments. Acceptance is to see, acknowledge, and not judge what is present so you can make better decisions for yourself and all concerned. Do not waste time in denial. If you wonder if you are in denial, think about what you would say to a dear friend if they were in your situation. Acceptance is about attitude, choices, and direction. Acceptance carries the energy of “all is well” and “I have choices (inner and outer)”. With an open attitude, you can see more options and direct your life in better ways. The Latin root for cept means “taken.” When you accept, you take something at face value, take it for what it is, and take it towards yourself versus pushing it away or having an attitude of against-ness. Take in what is present. Take and own your success using the ever-present skill of acceptance. And don’t forget to accept and be grateful for all the good things in your life! “Understanding Series: You Have Options”, “Acceptance Poem”, “Quotes about Acceptance”, “Feelings are Non-Negotiable”, “There is No Such Thing as a Table For Two”.